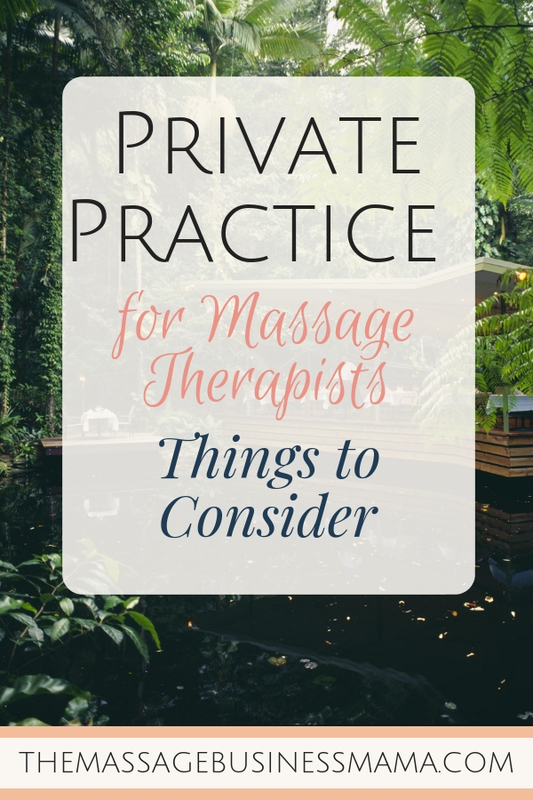 In this Post: Are you a Massage Therapist considering opening a private practice? There is a lot that goes in to running such a business, more than meets the eye. Spend some time with this post to get clear about all the factors involved with entering this rewarding endeavor. 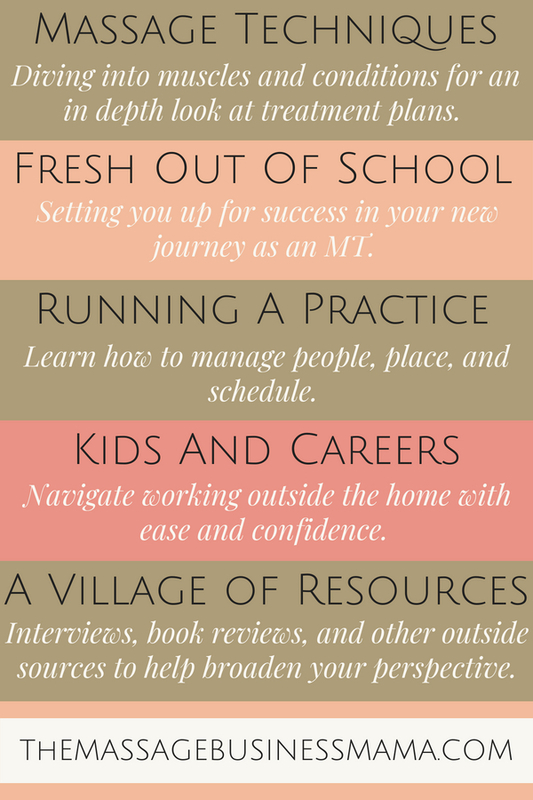 So you want to go into private practice? The beautiful thing about private practice as Massage Therapists is you can take it in so many different directions! You are fully in charge and dictate all the decisions that need to be made. You can work in an office all by yourself, in a co-op with other practitioners, at an in-home practice, or in a more clinical environment such as a PT Clinic or chiropractic office. Truly the options are endless for how you can structure your private practice. You can have people working for you, or you can be a solopreneur. Your imagination is the limit in what you can do and offer. All that being said, the buck stops with you. There is no one else to answer questions, make decisions, negotiate contracts, return email, and all the other things that need doing to keep a business running smoothly. Trust me there is a lot that needs doing when you have a business! Before you jump head first into creating the business of your dreams, it would be wise to sit down and write out a business plan. Take some time to consider all of the factors; expenses, logistics, and marketing, to name a few. The more time you spend organizing yourself and getting clear about your budget and expectations the greater your chance for success. Opening a massage business is TOTALLY doable, but you do need to be wise and think through your decisions. Probably one of the more important decisions you will make will be where you will operate. Not only do you want it to be attractive and have good energy, you will also want to consider the following factors. Is there adequate parking? Make sure to check out the parking situation at different times of the day. Maybe the dance studio next door has little traffic during the day, but after school it is a zoo. This may not be an issue if most of your business is daytime business, but if these after schools hours are also your prime hours there could be tense parking situations. The last thing you want when trying to help your client relax is to have them stressed out about parking! Who occupies the space next to, or near you, is an essential factor to consider when choosing a location! Sharing a wall with a jewelry repair or tattoo shop may be less than ideal. Whereas being next door to a chiropractic office may prove to be a great source of referrals! Who takes care of things like snow removal, lawn mowing, bathroom cleaning, and other communal responsibilities? Is the space big enough to work comfortably? Does the space include a waiting area? Is there room for two tables to perform couples massages if you so choose? Are there adequate bathrooms for the number of people utilizing the space? Remember that you will need access to a sink between each appointment to wash your hands and tools. Is the entrance well maintained? Is it handicap accessible? Will your clients need to negotiate stairs in order to access your treatment rooms? Stairs may be okay if you are working with athletes, but if you specialize in geriatric massage, you may want to reconsider a location with stairs. Is there laundry in the facility. Laundry may not seem like a big deal in the beginning, but I promise you will get sick of lugging laundry back and forth once you start jamming! Maybe you choose not to have an office at all. I have one friend, who in her 15 years of practice, has never had an office. Yet she has a thriving private practice. She travels to her clients’ homes to perform massages. For her, this has worked out amazingly well! She has low overhead, doesn’t have to keep an office clean, and gets to visit many beautiful homes with incredible views. Find a good landlord! Having a landlord who you respect and you can openly communicate with is priceless and can have a huge impact on how you feel in your space. What is included in the terms of the lease, what is extra? Make sure to get very specific and clear! What is the length of the lease are you negotiating? Some places have month to month options. While this option may seem enticing at first, it could create a lot of stress in the future. Month to month can be great when you are just getting started. It allows you the freedom to not have to commit. That way if it is too expensive, or you have an unexpected health emergency you won’t be locked into a potentially tricky financial situation. But once you have become established, being asked to leave quickly can put a considerable damper on business! Consider my friend who was required to leave four offices in five years because she rented month to month. Every time she moved office locations there were significant costs involved. In addition to these costs, there was confusion amongst her clients, and she created a lot of extra work for herself. She was continually painting new places and buying new pieces of furniture to fit in the various room configurations. You could get carried away and spend a fortune outfitting your space with the most up to date, elegant furnishings or you could repurpose things you already own and make do until you are making a bit more money. My advice would be to make due until you are profitable. You will be amazed by the items you have around your home that can really spruce up an office! In addition to items you may be able to find around your house like chairs, side tables, and decorations, you will also need a massage table, stool, sheets, blankets, pillows, and more. Here again, you could really go crazy advertising with every source available. My advice though would be to start small and test out what is working and what is not. While advertising can be quite expensive, marketing and networking, on the other hand, can give you quite the bang for your buck. Check out the local networking events in your community. I LOVE giving away gift certificates to worthy causes. I feel like this is a win-win. You are spreading goodwill while also getting your name in front of many potential buyers (think people who can afford massage), and the recipient of the certificate is a potential regular client. Every time I work on a new client I look at it as though they are interviewing me to become their new massage therapist. I treat these clients like gold! If you also treat such clients as gold, chances are good you will gain a loyal following in no time. Implementing good bookkeeping habits is a really good practice to establish in the beginning! You will kick yourself at tax time if you fail to do so. It might be wise to meet with an accountant before beginning your business to get some advice on how to keep track of it all. Not filing your taxes can get you in real trouble and even shut you down. Are you going to do online scheduling or have an old fashioned paper calendar? There are several online booking systems which make scheduling a breeze for clients, some cost money, and some are free. You will want to carefully consider which option works best for your lifestyle. If you hate answering and returning phone calls, you should probably run with an online scheduler. Whereas if you are an uber control freak, it might seem old fashion, but paper might be the best for you. These days websites are pretty important! Make sure your website is mobile friendly as a growing majority of clients will be searching for you from their cell phone. There are several options for starting a website. You could go with a prebuilt site where you simply drag and click the options you want into place, a self-hosted WordPress site, or you could hire a designer. While it might seem intimidating to build a site on your own, I will tell you that it may be easier than you think. For years I had a designer help me with my website, until one day I got fed up. I had spent six months communicating with my designer about trying to make my website mobile friendly. Nearly in tears with how long the process was taking, I started googling questions, and within a few hours, I had converted my website to a mobile-friendly being. All that time I wasted, feeling like I was incapable of making the necessary changes, when all it took was a couple of hours of me getting serious to figure it out. This was a hugely empowering experience for me! I no longer needed to spend money on a designer. I could make simple tweaks easily. There are so many resources out there if you ask google for help! You are going to want to put some time and energy into deciding how you want to handle no shows, late arrivals, package deals, pricing in general, intake forms, and unhappy clients. The more you can get all of this in writing the better off you will be. It is smart to get all of your policies updated on your website; this gives your business a professional put together feel. People will take your newly established business more seriously when they see that you take it seriously as well. Are you going to have a landline, or will calls go through your personal cell phone. If you choose to have calls go through your personal cell phone, you may consider getting a separate line such as google voice. This way you can distinguish between personal calls and business calls. I wish google voice had been around when I started my business! Some online booking systems have credit card processing systems built in, which makes life easy. If you choose not to go with an online booker or your program doesn’t come equipt to handle credit card payments, you will need to research options. Maybe you decide not to accept credit cards at all, I spent thousands a year in credit card processing fees so I can’t say I would blame you if you decided not to accept credit cards at all. My last bit of advice for opening a private practice as Massage Therapists is to realize that things do not happen overnight! You must be patient when building a practice! Patient and consistent. Unless you consistently show up for yourself and your clients, your business will never take off. This means dedicating time each week to marketing, budgeting, and bookkeeping. If you commit this type of consistent effort, you will be operating a successful private practice in no time at all!